Now that I have shared the truth about satan and demonology, I will move on to the next study in this series – The Doctrine of God’s Angels – Many facts about these angels, such as their creation, their bodies, etc. were covered in the Doctrine of Demons lesson. Seeing the devils started out as righteous angels, the facts are the same. Now, let us discover more information about the righteous angels. A. Michael – a prince with God. “One of the chief princes” – Daniel 10:13 “But the prince of the kingdom of Persia withstood me one and twenty days: but, lo, Michael, one of the chief princes, came to help me; and I remained there with the kings of Persia,” “Your prince” – Daniel 10:21 “But I will shew thee that which is noted in the scripture of truth: and there is none that holdeth with me in these things, but Michael your prince,” “The Great prince” – Daniel 12:1 “And at that time shall Michael stand up, the great prince which standeth for the children of thy people: and there shall be a time of trouble, such as never was since there was a nation even to that same time: and at that time thy people shall be delivered, every one that shall be found written in the book,” “The Archangel” – Jude 9 “Yet Michael the archangel, when contending with the devil he disputed about the body of Moses, durst not bring against him a railing accusation, but said, The Lord rebuke thee,” “Michael and his angels” – Revelation 12:7 “And there was war in heaven: Michael and his angels fought against the dragon; and the dragon fought and his angels.” Note: Michael is the only archangel mentioned in the Bible. The word “archangel” only appears 2 times in the Bible (1 Thessalonians 4:16, Jude 9). If Michael is the only archangel, it will be his voice we hear at the Rapture. Remember – Angels are messengers. The message will be “Come Up Hither.” However, Daniel 10:13 seems to indicate he is just one of the archangels. 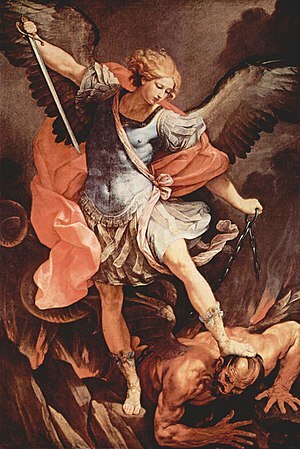 Archangel means “chief angel” in Greek.